Renault was the victim of the wave of simultaneous cyber attacks that hit dozens of countries around the world on Friday, it was learned on Saturday from the management of the car manufacturer. "We were touched ," a spokesman for the group told AFP, adding that the manufacturer was analyzing the situation. "An action has been in place since yesterday (Friday) evening. We are taking action to counter this attack , "he said. A spokesman for Renault's subsidiary in Slovenia, Revoz, told AFP that the computers at the Novo Mesto plant had been hit, resulting in a production shutdown. "We can confirm that on Friday, May 12, problems affected part of the computer system of Revoz, resulting in a shutdown of production at night. She remains suspended on Saturday. The problems are mainly linked to France where certain Renault sites have also suffered from malfunctions, " she said. Renault is the first French company to admit to being affected by this massive cyber attack, which has affected many countries including Great Britain, Spain, Portugal, Mexico, Australia and Russia. In Spain, the Ministry of Energy said on Friday it had "confirmation of various cyber attacks against Spanish companies" , by a virus "ransomware", which blocks access to files as long as a ransom has Not been paid. In a statement published in Madrid , the ministry is nevertheless reassuring: "the attack has punctually affected computer equipment of workers of different companies" and "it does not therefore affect the provision of services nor the operation of the networks nor the l User of these services " . The attack "does not compromise the security of the data and it is not a leak of data ," insisted the Ministry of Energy, also responsible for digital. 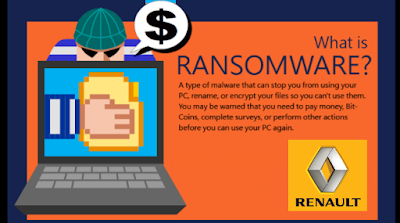 The National Cryptological Center (NCC), a division of intelligence services responsible for information technology security, spoke of a "massive attack of ransomware" , cryptoware or "ranongongiciel" in French, of the WannaCry type. The attack "affects Windows systems by encrypting all their files and shared networks , " said the SCC . The ransomware is a small computer program, hidden most often in a seemingly innocuous file, which makes it possible to prevent the user to have access to files as long as it does not pay a ransom. Telefonica was forced to turn off computers at its headquarters in Madrid, AFP reported to a source in the company not wishing to be identified. The virus "has hit hundreds of computers here at the company's headquarters ," the source added, assuring that user services were not affected. Several Spanish media reported on Friday morning that Telefonica employees had been warned by megaphone of the urgency to turn off their computers, which confirmed the source within the company. A spokesman for the Spanish energy group Iberdrola told AFP that "precautionary measures had been taken" by the company as a "major customer of Telefonica" . "We switched off computers as a precaution, because all of our servers are hosted by Telefonica, but there is no problem, 100% of the installations are operational," the spokesman said. Parallel to the situation in Spain, computer attacks have affected British hospitals. Again, this is a "ransomware" attack of the Wanna Decryptor type, according to a statement from the public health service , the NHS. The organization states that the attack was not aimed exclusively at hospital services, but that other structures in different fields are also involved throughout the UK. British Prime Minister Theresa May said Friday night that the cyber attack on the public health service (NHS) was " an international attack " affecting " several countries and organizations ". According to analysts at Forcepoint Security Labs, the attack would be " global reach " and would affect organizations in Australia, Belgium, France, Germany, Italy and Mexico. It would be " a major campaign of malicious emails ".